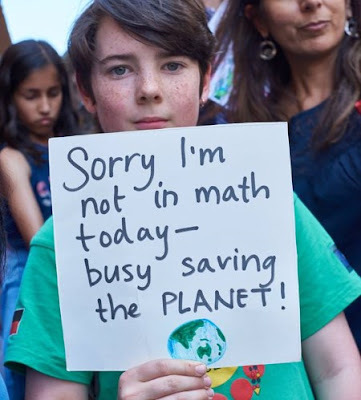 Simple actions to help tackle the inconvenient truth that is climate change. When the media and politics talk climate change there's we hear a lot about renewable energy versus coal. Fair enough, electricity does account for 34% of our country's emissions. But what about the rest? 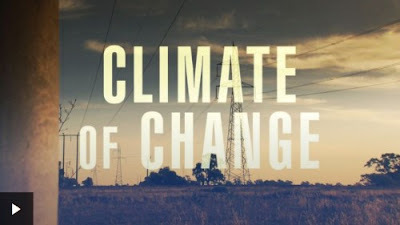 ABC's Four Corners program did this documentary about Australia's emissions, where we are compared to the rest of the world, and what can be done to improve. Here is my quick summary. You can also watch it online, or read the transcript. Transport emissions are growing because our population is growing and our demand for transport is increasing. Our vehicles are improving but not quickly enough to match our increased use. We currently have no emission standard on vehicles. In the USA and Europe vehicles are more efficient and cheaper to run. Some countries have already started phasing out petrol and diesel cars in favour of electric vehicles. Norway is the leader with 31% of new cars being electric. In Australia it's 0.2%. Even in the UK, there are 29 affordable models of electric cars (under 60,000 AUD). Here in Australia we have 4. Australia is the world biggest exporter of natural gas (LNG). If the countries that buy this gas are burning it instead of coal, that's good for world emissions. But Australia's emissions are higher because of the energy used to extract, liquefy and transport it. The industry's rate of improvement in energy use and carbon intensity is at the bottom of world standards. Why? Australia has a 'baseline' system where big polluters are each given an emissions cap. If they exceed that cap they are penalised - at least in theory. One-third of big polluters have been allowed increase their cap. Emissions from these polluters is up 12% in the last four years. The rules around changing the cap we changed last month. Bizarrely, they make increasing the pollution cap even easier. Agricultural emissions is usually a hard area to find reductions. There are a lot of methane emissions from livestock. However, Australia's science agency CSIRO has discovered a natural feed-additive that reduces livestock emissions to almost zero. Electricity emissions are trending down as renewables replace coal and gas. 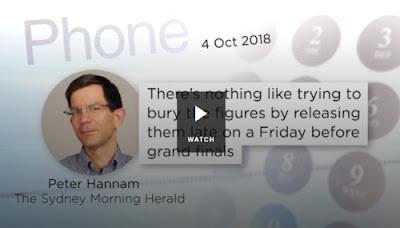 Transgrid, the network operator in NSW say the last time they connected a coal power station to the grid was 1992. Wind and solar are very affordable now. French company Neoen started in Australia in 2012, and now have built half their global capacity here. They say a long term goal is needed and that such a goal is not a burden but a certainty for investors. At the moment 2/3 of Australia's power still comes from coal. These power stations are old and due to close. We need to start soon and do so in an orderly fashion, so that they don't all close at once. The current government buys carbon reductions by giving money to projects that reduce emissions. Sounds good in theory, but there are two issues. As discussed earlier, companies are being allowed increase their pollution so this "emissions reduction fund" is not reducing emissions, just trying to make up for industry's increase. Secondly, some projects would still occur without the government funding. So we're spending money on projects that would happen anyway. In short we're spending money we don't have to spend and emissions aren't reducing. So how will we meet our Paris target of a 26% reduction in emissions? The current government is looking to use "credits" from a previous time period where we met our targets. One of the experts on the documentary said it's like failing your year 12 exams and trying to increase your mark because you got excellent results in year 8. Also the Paris meeting was held in 2015. Next year all the nations gather again and are expected to improve their targets. The way we're going we can hardly reach the weak targets we currently have. 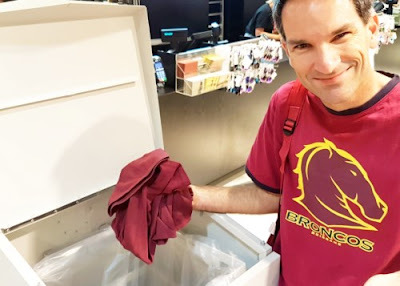 Despite Australia doing so poorly at the moment, there is much hope when we see what is possible. One of the experts has the opinion that "when the debate is over, the economy and people will move forward and take a lot of advantage". I'm looking forward to that. 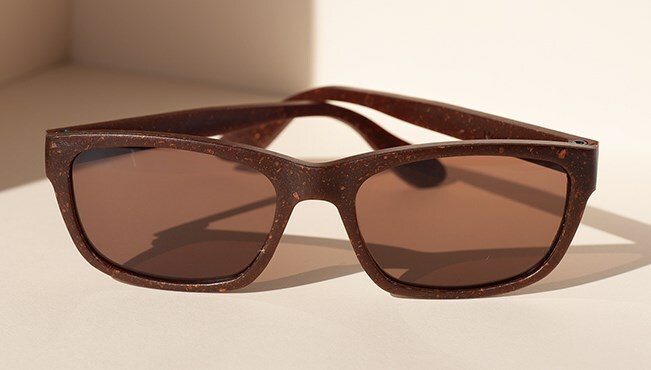 An obvious everyday action we can take is to recycle - and to buy products made from recycled material. A great example is the company Who Gives A Crap. This company makes recycled toilet paper, gives free delivery (in metro Australia) and gives 50% of profits to build toilets in developing countries where people are literally dying from diarrhea etc as a result of poor sanitation. 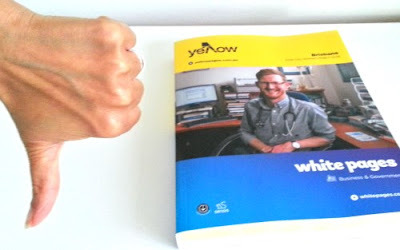 If you haven't yet bought from Who Gives A Crap, here's a special $10-off offer (for a limited time). It has no inks, dyes or scents and the packaging is zero-plastic; all cardboard and paper (easy to recycle). The rolls are also double-length rolls so you get a lot more use between roll changes. Note that this is a special offer for new customers. Existing customers, you already know how good this is - you don't need extra enticement. We've had other hot summers but this one was at least 50% hotter than the previous record. And it's obvious where the trend is going. 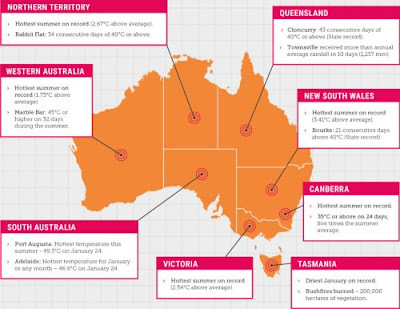 The Climate Council summarised this Angriest Summer with an infographic. In my home state, Cloncurry had 43 consecutive days over 40°C (104F). That's a state record. In South Australia, Adelaide recorded 46.6°C (116F) - it's hottest ever temperature. Port Augusta took the title for the hottest temperature of the summer, with 49.5°C (121F). I thought Autumn might bring some cool relief but even this week there's been two days of 36°C or more (97F). In Autumn. 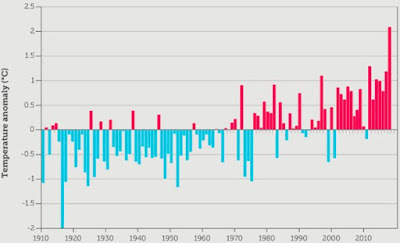 Scientists are predicting a warm autumn too - and that's certainly been true so far. 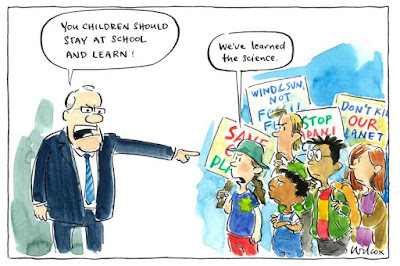 The Australian government repeatedly tries to assure the public that we will meet our greenhouse target. But many are becoming very sceptical. Let's look at why. The target we set for ourselves, and committed to, is a 26% reduction in carbon emissions by 2030 (compared to 2005 emissions). Yes it is a fairly weak target - taking a quarter of a century to do a quarter of the job - but that's a discussion for another day. The start of the line is 2005 - the year we are comparing with. To reach our target, we have to get back to that level - and then another 26% below it. In just 10 years. It's been 15 years so far and the only meaningful decrease was in the carbon price period. We'd need to do at least as well as that for the next decade to even get close. The section marked "Emission Reduction Fund" seems to have no reductions at all and this is the policy the government wants to stick with (although with less annual funding). It's no wonder that dozens of the country’s leading climate and energy experts have signed a joint statement stressing that without further action Australia will not meet its 2030 pollution reduction target. Something needs to change. Big time. Otherwise we'll be far closer to 26% more emissions rather than 26% less. This weekend phone books arrived on our doorstep. Nearly 800 pages of info we'll never use nor need. Thumbs down for pointless waste. To add a little more pain they wrapped all the books for our apartment building in shrink wrap. Aaagh! You can avoid this happening to you, and eliminate waste at the same time. Go to Directory Select. Enter your street address to see the phone books you are currently set to receive. Highlight the ones you wish to cancel, tick the box and click to cancel. It's really as easy as that. 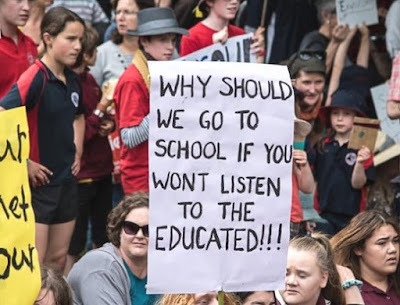 Last Friday schoolkids around Australia had a half-day strike to protest the lack of climate action by the federal government. It drew a predictable response (not a listening one) from some government politicians - well summed up in this cartoon by Kathy Wilcox. Some signs pointed out the irony of the reaction. For example, "If you were smart we'd be in class". While others tried to appeal the better nature of politicians and think of those who will be left to deal with climate change long after today's politicians have all gone. In the background a smaller girl is holding a well-coloured-in sign "Don't Burn Our Future. No New Coal"
But this one's my pick for the cutest. This Saturday it's everybody's turn. 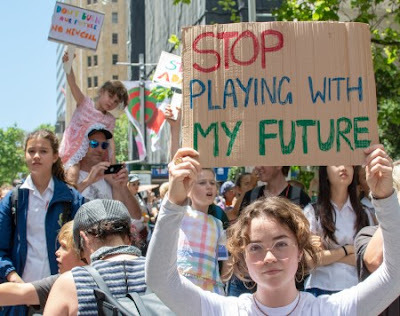 If you're in Brisbane, Melbourne or Sydney, join in the "March for our Future". 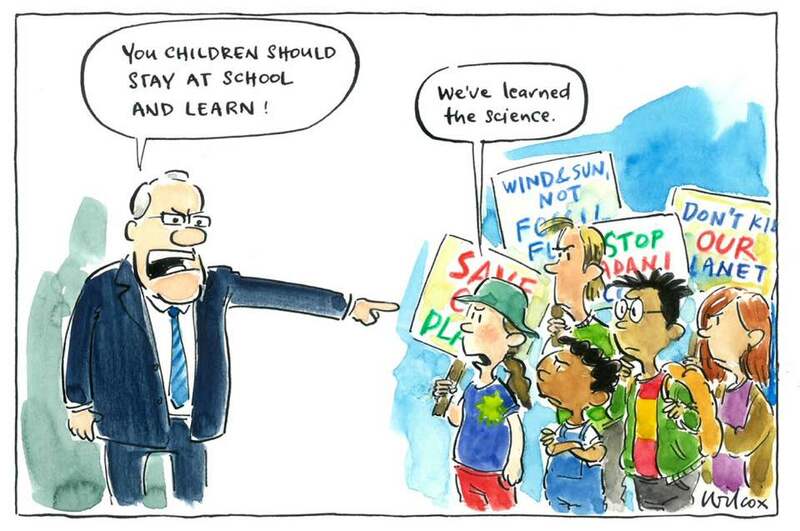 It's not just the kids whose futures are at stake. What to do with old clothes? 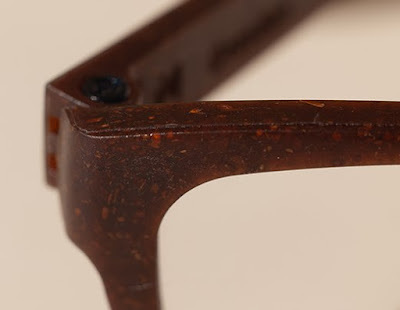 Some are technically wearable - but waay out of fashion, or getting a bit old. Some are beyond wearing. What can I do that isn't adding to landfill? Now there's a recycle option. One that comes with rewards. 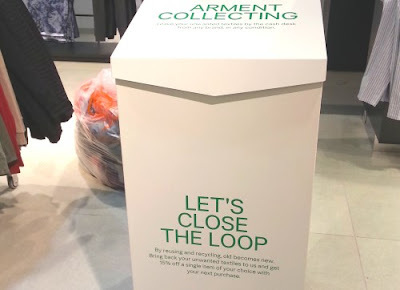 Fashion store H&M has a zero waste goal for the clothes (and other textiles) that you drop off in their recycle stations. So far they've taken in the equivalent of 89 million T-shirts for their Rewear, Reuse, Recycle process. Clothing that can be reworn is sent overseas for second-hand use. Textiles no longer suitable to wear are converted into product such as cleaning cloths. Textiles that can't be reused are recycled into textile fibres or used to manufacture products such as insulation materials. For each bag of used textiles they'll give you a discount voucher. Mine was 15% off your next item. It may vary for different places or countries. If you don't need it, why not pass it on. It's a chance to brighten the day of a random shopper. Up the back of the shop, look for a recycle station like this one. To get your voucher, talk to a staff member first. For more information see H&M Recycle your clothes or their partner Ico-spirit. Renewable Energy: Who's winning and how? Here in Australia, states are stepping up to embrace the future of renewable energy. So who's doing the best? Leading the nation with 87% renewable energy in 2017, Tasmania is an obvious front-runner. The ACT has a goal of 100% renewable energy by 2020 - just two years from now - and look to be on track to get there. Their government is also providing battery grants to households to help store solar energy for later use. Already at 43% renewable energy, South Australia has the largest energy battery in the country and is planning more. The forecast is that they'll have about 73% within 2 years. My home state of Queensland is listed as "catching up" with a 50% renewable energy target (for 2030). We have the nation's highest percentage of homes with solar, though this is more because of the great weather rather than any government action. 69 wind and solar plants are under construction in Australia right now - creating almost 10,000 jobs. These projects will add seven times the capacity of the now-closed Hazelwood coal power station. There are now 26 suburbs where the majority of homes have solar. 19 of these suburbs are in Queensland. Last year more solar PV capacity was added than coal, natural gas and nuclear combined. Almost three-quarters of new energy generation capacity is renewable. Electricity generation from coal and gas fell for the fifth year in a row. 17 countries generated more than 90% of their electricity with renewable energy. You can see the Climate Council's full scorecard and report to get all and details. Dresden's new store opens in Brisbane tomorrow, 6 November. I've been in touch with them and here's a sneak preview of the new (recycled) frames they will launch when the Brisbane store opens. And of course, they are also available as prescription sunglasses. I'm told they're made out of recycled wood fibre. Not 100% sure what that means, but I'm sure there'll be more details when they're officially launched. The Brisbane store will be at 4/173 Boundary Street, West End. Their number is 3846 5958. 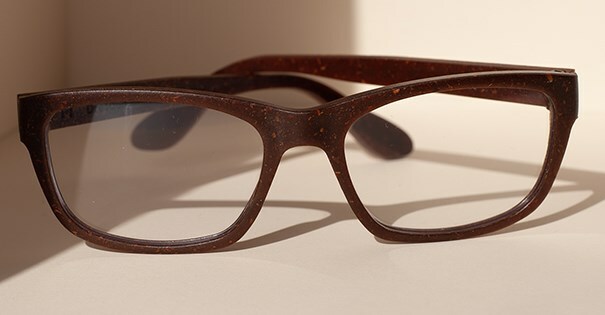 They also have a limited-edition range of frames "made of money". Yes, they're literally made from recycled off-cuts and waste from the polymer banknotes. Queensland's Container refund scheme starts 1 November. It's great for the planet, for people and for community groups. Here's why. 3 billion containers are used in Queensland each year. They make up 23% of our waste. Even with kerbside recycling, the majority end up as litter or in landfill. We recycle only about 30% of our containers. In South Australia (who've had a container deposit scheme for years) the rate is 80%. Clearly a cash-for-containers scheme is a good idea. Queensland's will be called Containers for Change. From 1 November there will be 250 refund points (see the map) where you can receive 10 cents for every eligible container - including aluminium cans, glass bottles, plastic bottles and some drink cartons. Some refund points will be reverse vending machines - like the demo one I showed earlier (see the video). These are literally what they sound like - you give a container and get money. Each container has its barcode scanned. If the barcode matches an eligible container you get paid. There will also be places you can take containers to and drop them off. The advantage of these (other than not having to feeding all your containers into a machine) is that even if the aluminium cans are squashed, and the barcode isn't readable, they are still accepted. How does it work for community groups? After litter reduction and more recycling, the third aim of the scheme is to help community groups. People can donate their containers to the local sports club, scouts, church or school - and that organisation can receive the refund. This can be done by physically donating the container or by a virtual donation. Either way, the first step for a community group is to register and get an ID number (this is how you get paid). Publicise your ID number through your community group. When your members return their containers they can quote the community group's ID number and the refund is paid to the community group's bank account. In this case people donate the actual containers at your scout hall, soccer club or church hall. Somebody from the group can return them in bulk to a refund point. Again, they quote the community group's ID number and the refund goes to the group's bank account. At my local school they've got small wheelie-bins bins ready to go. (You can get the logos and everything when you join). The logistics of this depend on how big your operation will be. Many refund points will be able to give you a large bag for collecting your containers, and a tag with your group's ID. If you're thinking bigger than that you may want to get a lockable cage where people can drop off containers any time of the day. If your group is having a big event, it may be a good idea to contact your local refund point in advance and they may be able to help. Once you community group decides to do this, go online and register and promote you group's ID to your members. Then, if you want to do physical collection, get in touch with you local refund point. Any questions, just pop them in the comments below. Happy recycling and happy fundraising. PS. This information is based on the seminar by ContainerExchange - the organisation running the scheme. For further details go to Containers for Change or to ContainerExchange. Do bad governments hide bad news? If there's anything worse than a government failing to cut pollution, it's a government covering up the failure. People in the media have noticed a pattern in the way Australia's government releases the national emissions data. It's very slow and it seems to be released at a time when it will get little attention. Mostly it's late on a Friday afternoon - too late for the news bulletin. Or just before the biggest sports weekend of the year. One year they even did it on Christmas Eve. Paul Barry reckons it's deliberate. To avoid the government getting awkward questions about why emissions increasing when urgent reductions are needed. Questions like how on Earth Australia can even reach our (rather weak) goal of 26% less pollution by 2030 while pollution is rising. The government says that ministers "considers briefs for a period of time". But for those periods of time to always end late friday - or on Christmas Eve is a staggering coincidence. This year's Climate of the Nation survey (a great name for people's opinions around climate change) has some very interesting - and some surprising results. 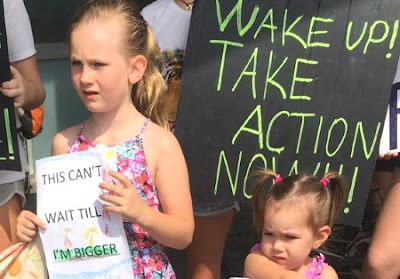 When asked if they we concerned about climate change and its impact of drought, the Great Barrier Reef and bushfires around three-quarters said yes. At the other end of the scale there's a shrinking number of people do don't even agree the climate change is happening. The vast majority of Aussies accept that it is happening. The results are shown by which party the people vote for. Even for parties that have non-scientific views, their supporters seem to be accepting the climate science. People were asked their 3 favourite energy sources. The top 3 were all renewable resources and solar was the clear favourite. 49% say we should stop building any new coal mines or expanding any existing ones. Only 20% disagree with this view. How quickly should coal go? About two-thirds of Aussies think we should stop using coal with 20 years. More than a third reckon it should be within 10 years. Aussies were asked how many people coal employs. Those who answered overestimated by a factor of more than 25. The jobs in coal are 25 times smaller than we think. The same goes for money. When asked how much coal contributes to Australia's GDP, people's average estimate was 10.9%. It's not even a tenth of that. The true answer is just one percent. While the coal industry makes some noise, the reality is that it's just not worth as much as we may think. Perhaps unsurprisingly, this idea is even more popular among younger people - those expected to have to live with the consequences for longer. 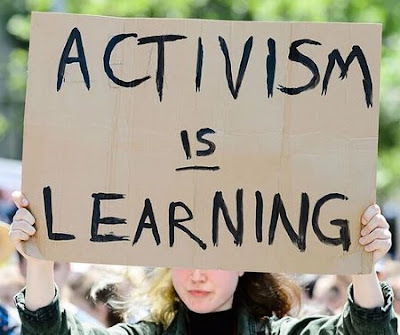 Overall it's good news that Australians want to take action on climate change. Hopefully politicians can reflect this desire in their actions. PS. You can download the full Climate of the Nation 2018. A lot of greenhouse emissions come from companies. Often they state their emissions in the annual report. But sometimes they're a bit tricky about it. It's a little thing called emissions intensity. Intensity is a company's carbon footprint divided by how much business it does. It's a handy way to compare different-sized companies in a similar industry. A larger company may pollute more but (for its size) be cleaner than its competitors in terms of pollution per customer, or per item made. How can it be mis-used? A company with a range of products may report emissions per dollar of revenue. 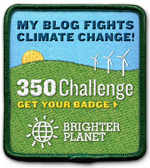 For example, a T-shirt that causes 20kg of emissions and costs $20 has an emissions intensity of 1 kg/$. If the price goes to $25, the emissions intensity becomes 0.8 kg/$ - an apparent 20% reduction even though nothing has changed except the price. It's very tempting for companies to use this figure in annual reports. Telstra this year reported a 24% decrease in carbon intensity - measured per petabyte of data transmitted (a petabyte is a million gigabytes). I wasn't fooled. It sounded good, but I wanted more info. Their total emissions are down - but by just 3.9%. Not bad. But nowhere near 24%. So while the total greenhouse emissions are only slightly decreasing (the green bars in the graph) the carbon intensity (the numbers in the circles) give a far rosier picture. In this graph alone, data (green line) almost tripled. "Intensity" can trick shareholders and customers us into thinking we're making huge progress - while we continue to pollute as much as before (sometimes even increasing our pollution). Personally I think yearly emissions should be reported as tonnes of carbon pollution. Intensity should only be used to compare with other companies in the industry. If you're going to an AGM, why not ask a question about your company's emissions? I raised the question at a recent Telstra shareholder meeting - asking about actual emissions rather that intensity. the representative couldn't even tell me whether emissions had gone up or down in the past year. We need to get this on their radar. PS. I also asked another question. Subscribe to be notified when I write about that. 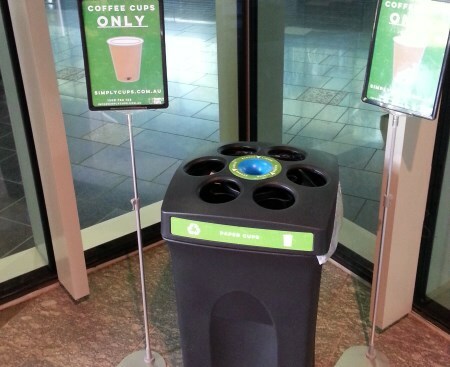 Today is the start of the "eco coffee cups" deal at Toowong Village. Spend $10 at the shopping centre to get a free re-usable coffee cup - and a bonus free coffee. There's a limit of one 1 per person per day, so if you want a cup for every person in your office, that will take a while. Not really - except for the choice of designs (but you may like them). Collection times are 9am-6pm while stocks last. Just take your receipt (on the same day) to the info desk on the basement level for your free cup. Is it really free if I have to make a $10 purchase? Good point. Making a needless purchase in the name of being "eco" would be odd. However the deal covers all stores including groceries (albeit Coles), the fruit shop and a bakery. So if you'd buy those kind of products anyway, why not get a free reusable cup? How bad are disposable cups? Toowong Village say that the coffee cups used by Australians in a year could stretch around the globe 2.5 times. For further info see the centre's announcement. It's good to see the centre doing something - even if some of its coffee shops haven't yet joined Responsible Cafes. Perhaps we should ask each store if they have (or will) join and offer a discount for customer with a reusable cup. Related post: What's going on at the local shops? PS. This deal is now over as all the coffee cups have been claimed. Let me know if you hear of other centres taking an eco-friendly initiative. Recently I let you know how Simply Cups can help you get coffee cup recycling happening at your workplace. Normally a workplace might get a single collection tube. Larger places, like the Queensland University of Technology, have a dedicated coffee cup recycle bin. The central tube is designed for any excess drink left in the cup. 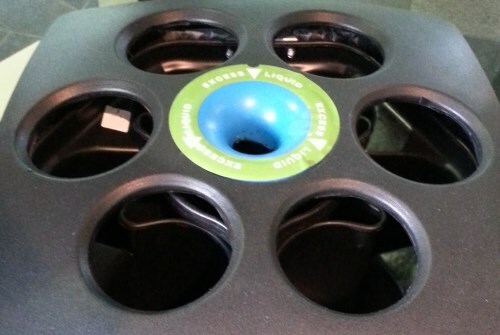 Then the cup itself (no lid) goes in any of the six outside tubes, automatically stacking inside the previous cup. The whole bin is about 70-80cm tall, so I reckon it could hold a few hundred coffee cups when they are stacked. 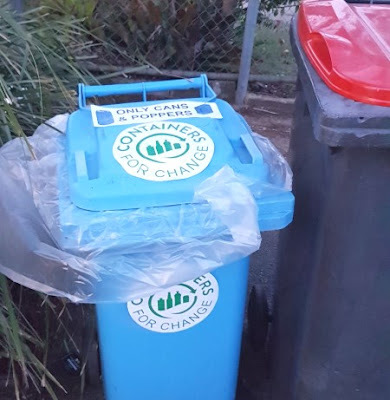 Since I took this photo, QUT moved the cup bin next to another recycle bin, to make it easier for people to recycle the plastic lids in the normal recycling. That helps make sure this bin has purely cups and also helps fit it as many cups as possible.